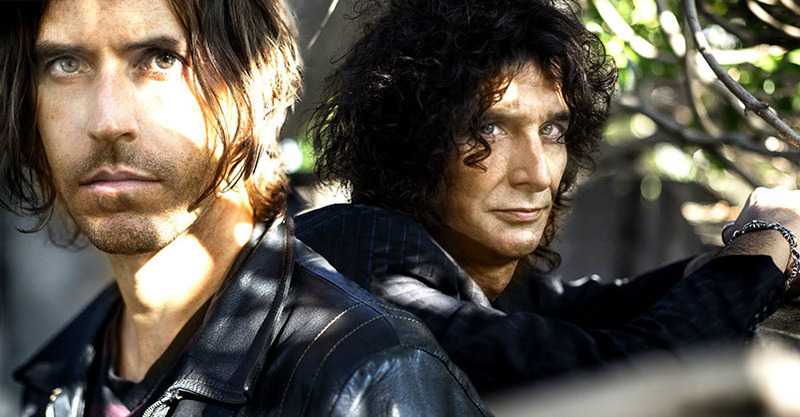 Los Angeles hard rockers Venrez caused a buzz with their 2013 album release, ‘American Illusion’ which saw the band tour across the USA and UK/Europe with Slash, Alice Cooper and Buckcherry. They’re now set to go over the top with their forthcoming new album ‘Children of the Drones’ and new music video ‘Hang The Predator’, Directed by Christopher Coppola (nephew to ‘The Godfather Trilogy’ Director Francis Ford Coppola) the new video and song serve as the perfect taster for Venrez’s forthcoming album. I managed to catch up with Venrez singer/songwriter/frontman Ven before he, together the rest of the band, flew out to begin their UK tour. 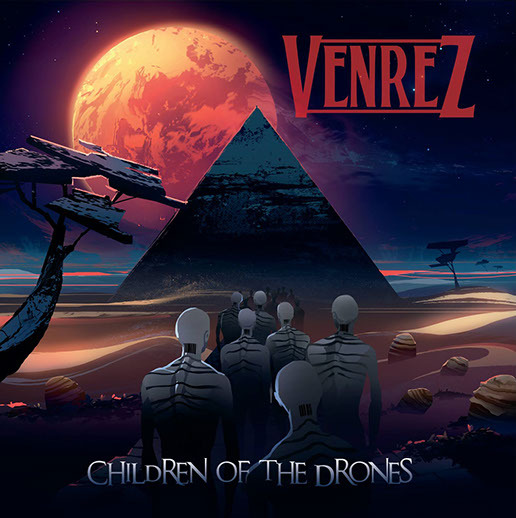 MJ: I’ve been listening to the new Venrez album Children of the Drones [set for release on 24th April 2015 via Monarch Music Group] and it’s got quite a feel to it. Take us through how the album came about? V: This is our third album and there were some unique differences with it that I’ll get to, but I think that the biggest difference as far as being a great natural progression forward is that the lyrics are still dark that I’m writing, the melodies are still there, it’s heavy but we’ve added more of a psychedelic sound. On the first album, Soul Alive, the outro track, “My Only Light” had a kind of Pink Floyd-y feel of psychedelicness to it. We did it again with “Temptress of the Moon” the outgoing track on the last album, American Illusion. And we just kind of sprinkled a little of psychedelicness into the heavy kind of 90s groove that we had for Children of the Drones. And I think finally stamped a signature on the Venrez sound with this album. MJ: What does Children Of The Drones mean? V: Well, my wife and I actually turned vegan a year ago, after watching some different videos and the cruelty to animal factory farming. And then you know just what’s going on in society and how important bees are to the ecosystem and things of that particular nature so I wanted to write a song about it. And Children of the Drones talks about it: “Concrete for the trees as they poison the bees”. And you know there’s a message and we put it on the album cover and besides those messages, the biggest message is, on the album cover the drones have a barcode on the back of their heads and there’s talk of us all having chips in our bodies at some point. I look at it like stepping out of that line. If you’re looking at the album cover you’re in line with the drones heading to the pyramid. So the message is step out of the line, be independent, think for yourself and don’t be controlled. And you know, that’s the song that I take a shot at corporations and government on every record. On this record it’s “Children of the Drones.” I think the world is the most dangerous world it’s been since World War II. And if there’s ever been a time for the younger generations of people around the world to step up I think now is the time to be doing it. And you know I could cheapen up the lyrics, we could go real poppy and crack into corporate suit control pop radio and pop rock, you know, but I haven’t sold out and it’s taken us a long path going into our 6th year now to really start getting somewhere but I’m proud of it because we’ve stuck to our guns, we haven’t sold out, we continue to write songs that we feel teach lesson and deliver messages that need to be delivered and I’m just not going to stop doing it. MJ: Accompanying your lead single “Hang the Predator” is a video directed by Christopher Coppola, Francis Ford Coppola’s nephew. How did that collaboration come about? MJ: It’s got quite a dramatic beginning, with ants attacking a scorpion. Can you explain that metaphor? V: “Hang the Predator” is my shot at corporate greed and government control. So the predator is who tries to control us and take our freedom back. And so that is my biggest shot at it. With what is going on in the world with North Korea and even our country with police brutality, I’ve seen plenty of craziness going on in the UK, you know the issues in Syria and Iraq and with ISIS…these monsters we’ve created we now have to deal with. Ee need to step up and do something to change the world for the positive. I really do think that we’re facing some serious dangers throughout the world based on human kind being out of control in an aggressive manner. MJ: There’s an interesting story, is there not, behind the lyrics to “Hang the Predator” because by all accounts these were quite old lyrics that you had sent to your guitarist Jason Womack and he found them one day? MJ: Is it fair to say that Venrez have now found their sound with this album? V: Yeah, I think so. I think so. We have four records now, but what happened when I formed the band in 2009 we had a very different lineup and it was another guy on guitar who was writing the lyrics and the sound and it became evident to me that we weren’t going to go anywhere unless I started writing my own songs. So, we had a change around and Jason stayed and we made an agreement to work together. Then I brought in the guys who had toured with us up until now, Alex Cane and Michael Bradford on bass, and Ed Davis on drums, who were not in the band at that time. And we went on a hodge podge of writing at the time called Witch’s Brew, which is a lot of different types of songs and sounds. 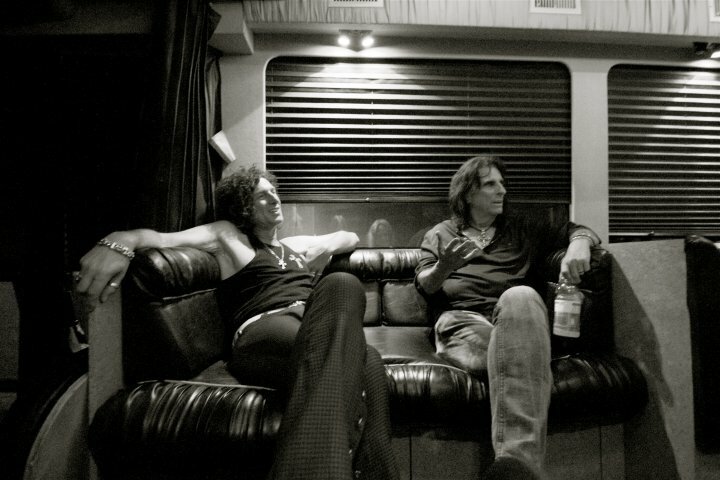 And then we started trying to tailor it from Sell The Lie to American Illusion and so it’s been a four album process. I say this is our third record because the first one, Witch’s Brew, was just a different band and sounds and songs that are good but not really where Venrez was going. So I think with Children of the Drones, it’s evolved. In other words, Sell The Lie was the baby, American Illusion was the teenager, and Children of the Drones is the full-on adult and we’re now 28 years old and for the next 10 or 15 years we’re going to give you a whole lot more of that kind of stuff. MJ: You’re going to be opening a UK tour on the second of March down at the Windmill in London. It’s not your first foray into the UK, but this is your first headline tour. V: This is our first headline tour anywhere in the world! And you know, there’s a few really nice club venues we’re heading to. Some of them are pubs and bars, you’ve got to start somewhere. We’ve been playing arenas and huge venues with bands like Slash, Alice Cooper, the last tour of Europe with Buckcherry, we were at Koko’s in London. The thing about going back to a smaller club tour it is so intimate, we do have a lot of fans in the UK, we’ve been there four or five times on tour, and I’m really looking forward to showcasing the band in a smaller, intimate venue-type situation and I look forward to it being very successful. We’re very excited about it. We leave in two days. It’s Wednesday here today and we’ll leave Friday and land in London Saturday, the 28th February and that we’ll start on the 2nd March in London and end up at Bathgate, Scotland on the 12th. MJ: What are we going to be hearing? V: You’re going to get the full-on Venrez show! And you’re going to get a good smattering of five songs off the new record and then some of our fan favorites, from Sell The Lie and American Illusion. Some songs we haven’t play in 2-3 years live, and I think Jason put together a brilliant set. It just rocks from the first to the last song and it’s going to give fans a nice mixture of the current album and the last two records. MJ: Ven, thanks for chatting with The Classic Rock Show. V: You’re welcome. I’m really looking forward to coming back to the UK. I just want to thank all of our fans for supporting rock and roll. I think a lot of artists forget they wouldn’t have a career and wouldn’t be able to enjoy what they do without the fans. 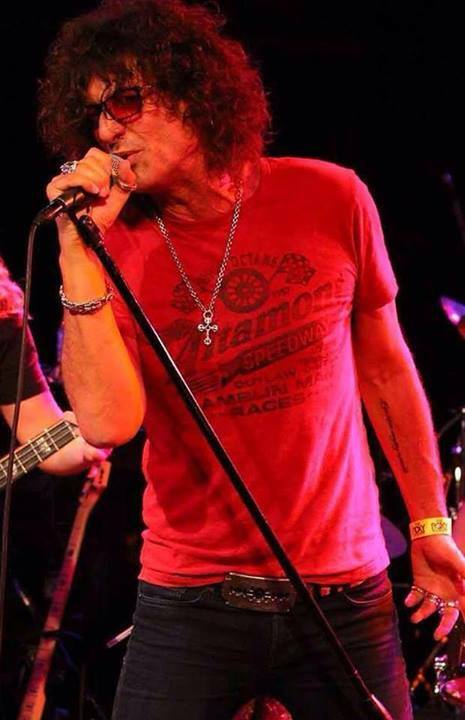 The first thing I always want to do is thank the fans for supporting rock music. Without you, there is no rock and roll! ‘Hang The Predator’ is now available on iTunes. ‘Children Of The Drones’ is released 24th April 2015 via Monarch Music Group.